Rule number one when you're on safari in Africa: always respect the animals' space. Especially if the animal is a 6,000-kilogram elephant. Recently uploaded to Facebook by Rudie Swanepoel, this spine-chilling footage was captured in a game reserve in Mozambique, and serves as a harsh reminder for tourists to keep their distance and heed the warning signs when viewing wild animals. The cellphone clip, filmed from inside a vehicle, shows an agitated elephant trying to frighten off a perceived threat. When the driver of the vehicle stays put and honks the horn, the elephant attacks and appears to flip the vehicle several times. Photos taken after the incident show the extensive damage caused during the short attack. According to media reports, the unidentified driver of the vehicle survived the ordeal; however, the extent of his injuries is unknown. So could this car-crushing elephant encounter have been avoided? Probably. Although the details surrounding this incident are sketchy, and it’s unclear what happened before the camera started rolling, the elephant appears visibly disgruntled before the charge. In most cases, a basic understanding of elephant body language and the ability to pick up on a few behavioural cues should be enough to help tourists avoid a potentially fatal encounter. Agitated elephants typically provide several warning signals before following through with a full-blown charge: ear-flapping, bush-bashing, trumpeting, dust-throwing and mock-charging can all form part of the pre-charge performance. If the ellie looks angry, it’s best to calmly back away. It is also possible that the elephant in this video is a male in musth – a heightened hormonal state that can cause these animals to become overly aggressive. 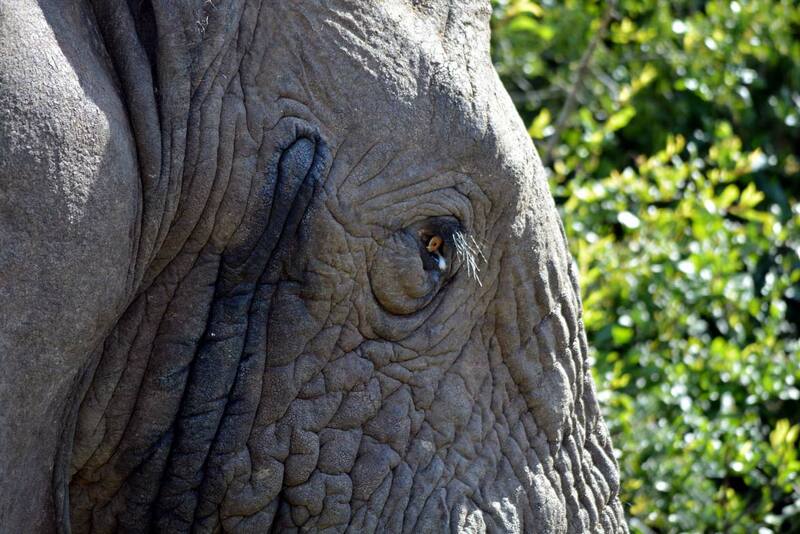 Fortunately for tourists, elephants in musth are easy to spot: a thick tar-like secretion usually oozes from the temporal duct just behind the elephant’s eye. If the face is a-oozing, stay away. According to Dr Marion Garai, chairperson of the Elephant Specialist Advisory Group (ESAG), it’s also important to be able to distinguish a "mock" threat from the real deal. And the ears are the giveaway here. When putting on a threat display, elephants will often charge with their ears fanned out. These mock charges sometimes are sometimes followed by an actual attack, and are used to test if a perceived threat is aggressive or not. If an elephant is mock-charging and showing other threat displays, it’s probably a good time to make a strategic getaway. A real charge will look a little different: the ears will be pinned back to the head and the trunk will be tucked under the body. You should also listen for trumpeting and keep an eye out for "displacement activities" such as a twitching trunk or a swinging leg, advises Garai. Well-known zoologist Dr George Schaller argues that these displacement behaviours are the result of fear, and serve as an indication that an elephant is still trying to figure out whether or not to charge. The more pronounced these activities, the less likely it is that the animal will attack. In the video above, it's possible that the elephant went into full-on attack mode when its threat displays were answered with a honking horn. The sound was perceived as an aggressive response to the mock charge. However, distinguishing between mock and genuine threats is probably a job best left to the experts. If you want to avoid an attack, your best bet is to respect the elephant's space. And if you do find yourself a little too close for comfort, retreat. Don’t spend what may be the last few minutes of your life filming. This young elephant has a go at intimidating a group of pesky tourists – with mom close by for backup, of course.